It wouldn’t have been much of a surprise to see the Grousbeck family sharing one or two celebratory fist bumps on September 16, the day the NHL officially locked out its players. With one less horse in the local sports derby, they might reasonably have expected an increased level of exposure and revenue for their Celtics. Though the Bruins and Celtics do not play home games on the same nights, people looking for a Boston sports fix would find one of their regular options unavailable, turning their attention to basketball in a year that might otherwise have generated only mediocre levels of buzz. This line of thinking assumes something about the typical sports fan: that he or she is just that, a generic sports fan, as eager to consume Celtics basketball as Bruins hockey. It also assumes that he or she prioritizes sports above other methods of consuming leisure time and dollars, such that the absence of one sports choice substantially affects the other sports choices in a city. Though the ramifications of the 2012-13 NHL lockout are as yet unclear, this assumption remains testable due to the existence of a similar natural experiment: the 2004-05 NHL lockout, which knocked out an entire season of hockey. It’s certainly plausible that NBA teams that competed with an NHL team for attention received a boost from its absence from the sports scene for a year. I set out to answer this question, examining whether those NBA teams that occupied the same city as an NHL franchise received a significant increase in fan interest—measured in attendance—from the lack of hockey during the ’04-’05 lockout. First, I collected the attendance figures for these 16 NBA teams during the lockout year and the two seasons before and after it, calculating them as a percentage of their arenas’ total capacities. 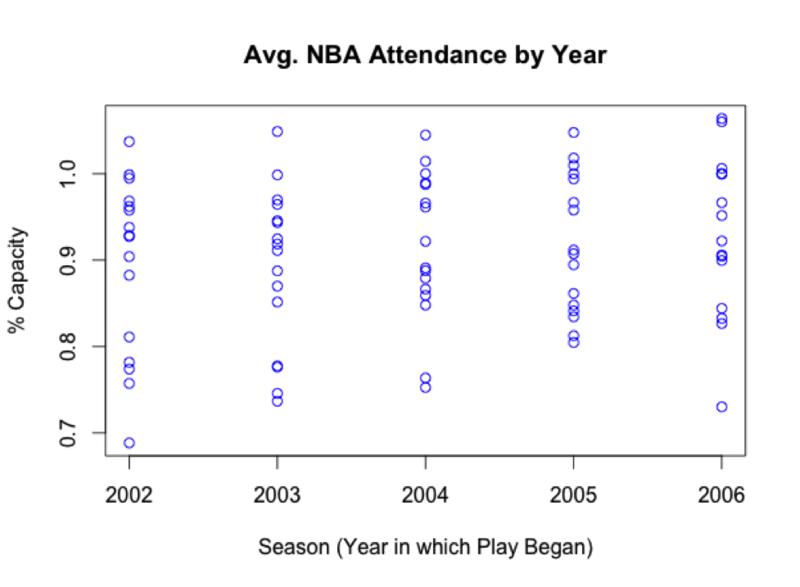 Average attendance did indeed rise during the 2004-05 season, but only slightly. 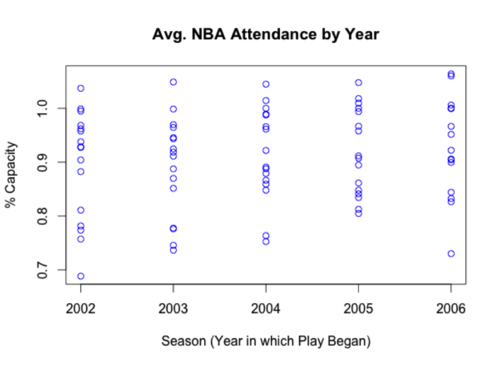 And as the plot below shows, there doesn’t seem to be a noticeable difference between the NHL lockout year and the ones preceding and following it; in fact, average NBA attendance rose again in each of the next two years following the lockout. If the return of the NHL did not once more take some fan support away from the likes of the Celtics and Pistons, the assumption that sports fans substitute nearly perfectly from one sport to another holds less traction. It might be that another reason better explains the patterns in team attendance: fans go to games that interest them, and a team that wins a lot is much more interesting than a team that loses a lot. To test this hypothesis, I gathered the winning percentages of these 16 teams during each of the five seasons I looked at—resulting in 80 team-years—and compared them to the corresponding attendance figures I recorded previously. 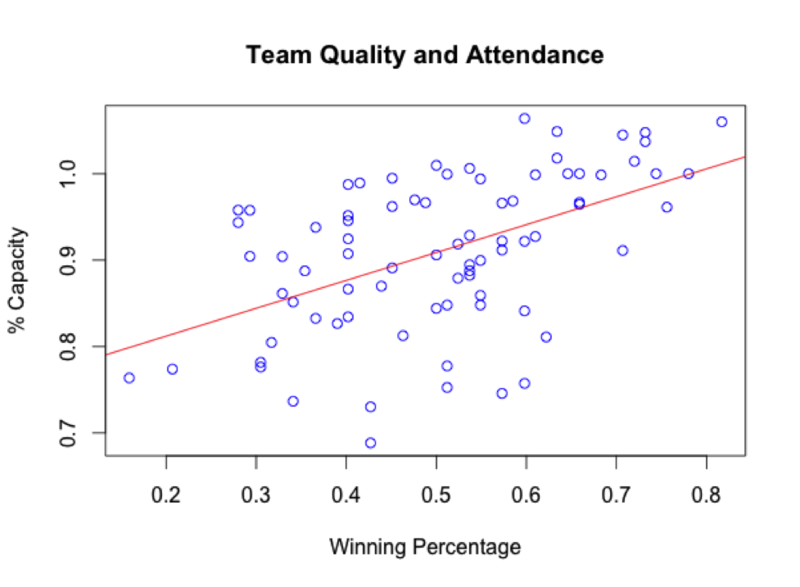 To determine if winning percentage was indeed a consistent predictor of attendance (plotted below, with a line of best fit), I ran a simple linear regression of the two variables. The model revealed a reasonably strong relationship between these two. 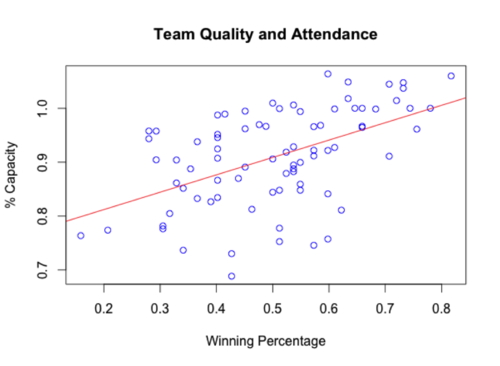 Winning percentage was a significant predictor of attendance (p-value < 0.001) and explained about a quarter of the variation in attendance (R-squared = 0.26). This finding corroborates some of the existing literature; the same relationship has been found in baseball, for example. While my analysis is not quite as rigorous—I’m not certain that a strictly linear theory of winning percentage and attendance is entirely accurate—I think I’ve at least confirmed the basic relationship and debunked one general hand-wavy hypothesis in the process. What most interests me about this is the idea that the fanbases of NBA and NHL franchises are more distinct than one might otherwise think. Perhaps the idea of a generic sports fan—or at least one who regularly attends games across multiple sports—is not as realistic as that of a separation between hockey fans and basketball fans. It might also be that the generic sports fan is actually a generic entertainment fan and is just as likely to spend his money on a Celtics game as on, say, a night out at the movies. If this is true, the absence of one entertainment option (NHL hockey) would not have as pronounced of an effect on a basketball franchise, given that it still has to compete with so many other entertainment options in the city. Personally, I’m inclined to believe attendance is primarily driven by simple human nature: people will pay for excitement, of which a winning team can supply more, and more consistently.